Hyperallergic reviews Jessi Reaves and Sophie Stone’s show at Del Vaz Projects. RIP: Tony Conrad, who passed away at the age of 76 due to pneumonia. Group of artists, scientists and politicians call for British Museum to drop BP sponsorship. Edinburgh International Festival no longer sponsored by BP. Donald Trump’s art collection actually consists of fakes? Dmitri Rybolovlev’s divorce from wife shows how he used offshore shelters to hide his assets, such as art. He denies he did anything wrong. Panama Papers also show that Nahmands control looted Modigliani – Seated Man With Cane painting. They reveal the fate of some of Basil Goulandris’s lost paintings. The Panama Papers may also show that Joe Lewis bought the Ganz collection before its record-breaking Christie’s sale, netting an enormous profit. Spain’s Thyssen-Bornemisza clan, Wang Zhongjun, and Marina Ruiz-Picasso are also linked to the off-shore activities. Leyla and Arzu Aliyeva implicated in Panama Papers. The Neuberger Museum and other art groups denounce and protest Mississippi’s anti-LGBTQ law. Sweden’s highest court finds Wikimedia guilty of violating copyright laws by providing artwork without consent. Art Brussels director Anne Vierstraete discusses the fair following Brussels terrorist attacks. The organizers and participants remain committed and upbeat about the fair. Downtown Contemporary Arts Festival in Cairo opens amid cultural clampdown in Egypt. Russia’s Hermitage Museum offers expertise and help to restore ancient Syrian city of Palmyra. Fourteen men, part of so-called Rathkeale Rovers, arrested for thefts and attempted thefts at UK museums. Terence Koh un-quits art and will have a solo exhibition in May at the Andrew Edlin Gallery. Vincent Award cancelled this year after artists pull out due to museum’s involvement with Vo/Kreuk dispute. Rare wine world rocked by Ponzi scheme claim. The debate over the authenticity of Degas cast sculptures as Valsuani foundry closes. Qatari royal family wins right to question Picasso’s daughter and her son about contested bust sale. Stefan Simchowitz responds to Ibrahim Mahama’s countersuit. Bobby Miller sues Robert Mapplethorpe Foundation and others for using his images without permission. KPMG accuses the management team at Auctionata of serious trade violations. Christie’s closes offices in Boston, Palm Beach, and Philadelphia. It might be time to sell your Sotheby’s stock. Rivalry and competition between Christie’s and Sotheby’s heating up. Artnet details why we should worry about Germany’s radical new cultural protection laws. Daniel Hug speaks about it and calls it idiotic. Aeromoto opens as the first public library for art in Mexico City. PSSST to organise exhibitions of students who dropped out of the Roski School of Art and Design 2016 MFA. Concern after Iran’s Ministry of Guidance and Islamic Culture proposes privatization of Tehran’s MoCA. Bundeskunsthalle in Bonn and Kunstmuseum in Bern plan joint exhibition of Gurlitt’s controversial collection. Scott Indrisek thinks that the Luigi Ghirri show at Matthew Marks Gallery will make you want to quit Instagram. Ulay being tight-tipped and secretive regarding his Frieze Week NY performance. George Packer writes about Race, Art, and Essentialism for the New Yorker. New York’s most important art gallery district could now be the Lower East Side. The Culture Trip provides a guide to Chelsea’s ten best gallery spaces. New Shakespeare First Folio discovered on a Scottish island. Long-lost Caravaggio painting possibly found in private collection in France. Hank Willis Thomas forms Super PAC to raise funds to print political ads. According to The Art Newspaper, US museums spent nearly $5bil. on expansions between 2007 and 2014. New Renzo Piano-designed Whitney Museum to be named Leonard A. Lauder Building. Artist list and projects announced for Manifesta 11. Mike Bouchet’s contribution to Manifesta 11 is a 80-ton turd mountain. Salvation Army shelter designed by Le Corbusier and his cousin Pierre Jeanneret to open to public this month. Christopher Knight reviews Helen Lundeberg: A Retrospective at Laguna Art Museum. Samara Golden’s exhibition at Yerba Buena Center for the Arts is a Artforum Critics’ Pick. The Museum of Cycladic Art (MCA) in Athens announces a major exhibition with Ai Weiwei. Klaus Biesenbach receives the Cross of the Order of Merit from the Federal Republic of German. John Cage’s emphasis on performance at Black Mountain College. Elisabeth Murdoch creates Freelands Artist Award for mid-career women artists. It includes a £100k prize. New York’s Public Art Fund to show Tino Sehgal, Claudia Comte, and Carol Bove in City Hall Park. Christie’s to offer a $30-40mil. estimated Rotho painting in May sale. Zhang Daqian’s Peach Blossom Spring, sells for record $35mil. at Sotheby’s. Records for many artists broken at Sotheby’s Modern & Contemporary Asian Art Evening Sale. Bloomberg writes about Sotheby’s sales in Hong Kong defying expectations. The Telegraph writes about the Pilkington collection, which was auctioned by Sotheby’s for £45.9mil. Sotheby’s sale of Boutet de Monvel works surpasses pre-sale estimates by five times. Phillips’ May sale includes $5-7mil estimated Brice Marden painting. Chair that JK Rowling sat on to write two Harry Potters sells for nearly $400k at Heritage. Piet Mondrian-inspired dress by Yves Saint Laurent sells for $27.5k at Leslie Hindman Auctioneers. Jing Daily shows that the art market in China is still doing well. Artnet details the top-selling Brazilian artists at auction. CURA.’s top picks for Miart 2016. Artnet has a Miart 2016 sales report. Artinfo previews Art Beijing 2016 at the National Agriculture Exhibition Center. Artinfo previews Young Art Taipei 2016. Brian Boucher shares his picks for the top 10 works from São Paulo’s SP Arte Fair. He also provides a sales report from day one. Exhibitor list for Liste 2016 released. Teriha Yaegashi’s guide to visiting art fairs like a pro. Tao Lin discusses selling his artwork. Wall Street Journal gives the lowdown on irrevocable trusts for art collectors. Andrew Goldstein thinks that the Upper East Side is the best place to see art in New York. LA Weekly visits MorYork Gallery. Linda Yaklonsky writes about the opening of Hauser Wirth & Schimmel and the Mapplethorpe shows in LA. KCET visits the Daniel Rolnik Gallery. Magnus Resch develops an art collecting database app. Alexis Dahan interviews Jeff Wall. Jamian Juliano-Villani feature in Leap Magazine. Henry Taylor discusses the artwork he made while working at Camarillo State Mental Hospital. LA Times reviews Samantha Thomas’ show at Anat Ebgi. Mark Bradford creating site-specific work incorporating text of US Constitution for US embassy in London. 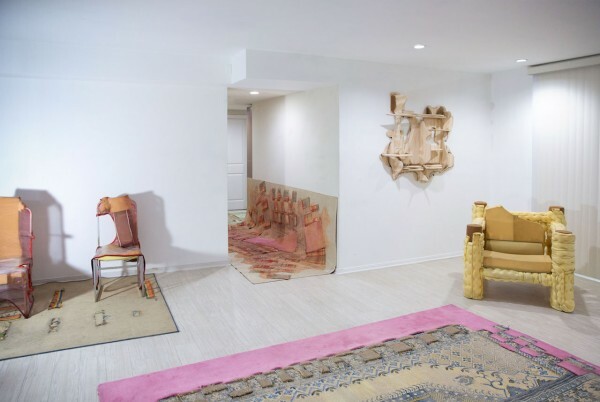 Christopher Knight reviews the Elaine Cameron-Weir at Venus Over Los Angeles. Michael Slenske profiles and visits Larry Bell. Ann Tempkin on Ellsworth Kelly. Richard Serra discusses seeing Kelly’s Colors for a Large Wall painting for the first time. Ed Bereal, Ed Moses and Larry Bell have a conversation at LA’s Neuehouse. LA Times reviews Lily Stockman’s show at Gavlak Gallery. Martin Puryear will receive the third annual Yaddo Artist Medal. Information and images up for Keith J Varadi show at Cooper Cole. Sojourner Truth Parsons’s Heartbeats Accelerating show at Tomorrow Gallery is a Artforum Critics’ Pick. Erwin Wurm will represent Austria at the 2017 Venice Biennale. The New Yorker profiles Ragnar Kjartansson. Wallpaper visits Carsten Höller’s show at Pirelli HangarBicocca. University Radio WYBCX interviews Jay Stuckey. The story of how Stuart Franklin shot his Tank Man photograph in Tiananmen Square. Green Room Radio interviews Dan Witz. Jean-Baptiste Bernadet snap shots of his everyday. Sotheby’s has studio visit with Danny Fox. Artnet highlights six London shows to get excited about in April. David Ebony’s top ten New York gallery show picks. A list of art films coming to a theater near you. Kenneth Anger official jacket and limited edition signed prints available from his site. Harper’s Bazaar covers Marc Horowitz and Petra Cortright’s wedding. Categories: Art, Contemporary Art, Low Brow & Pop Surrealism, Overtime, Street & Urban Art, Uncategorized. Tags: Contemporary Art, Del Vaz Projects, Features, Jessi Reaves, Low Brow & Pop Surrealism, Overtime, Sophie Stone, Street & Urban Art.